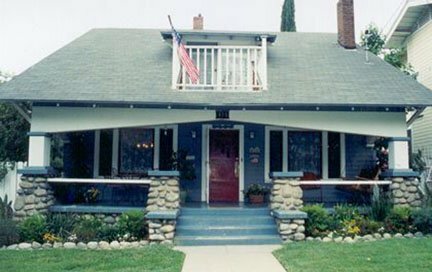 This wonderful example of an early 20th Century Craftsman Style home was originally built in 1910 for D.B. and Marie Kendall. Mr. Kendall worked at the Citograph for many years as a printer while his wife, Marie, worked as a schoolteacher. The house is a story and a half, square plan, with a decorative fieldstone foundation. It features two-tiered cement capped field stone columns, a large decorative boxed beam spanning the width of the porch, triangular knee braces and exposed rafter tails, and a shed roof dormer.